Mike has the girl, the time, and the place. The problem is...he doesn't have the ring. Before Mike has the chance to make his proposal, he's mugged at random and the ring is stolen. Now, desperate to recover it, he and his friends have just one hour to get the ring back and make the date before all is lost with his 'beloved' Emma. But neither Mike nor his friends are what they seem--and before the hour is up, a lot of people will die... 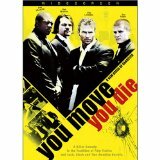 Shot in real time, You Move You Die is an intense, potent mix of biting wit and tongue-in-cheek comedy. Prepare for an explosive film with a jarring dose of reality.